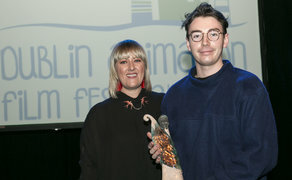 The winner of the Boulder Media internship prize is Joshua Hogan, a graduate of the Irish School of Animation, Ballyfermot College of Further Education, Dublin for his graduate film ‘Whack Jobs’, which was screened at the Dublin Animation Film Festival 2018. The internship is a three-month assignment, which is part of Boulder Media’s commitment towards assisting Irish and international animation graduates with their careers. We were impressed by the standard of the graduate and student films that were screened at this year’s Dublin Animation Film Festival. It was a tough choice as there so many contenders for our internship prize. We are looking forward to welcoming Joshua to Boulder Media in January 2019! It is a great honour to win the prize of a three-month paid internship with Boulder Media. I was thrilled that my graduate film 'Whack Jobs' was part of the official selection at this year's Dublin Animation Film Festival 2018 as I know I was facing a lot of competition, but to win the Boulder Media prize is huge! I have met some members of the Boulder team already and I am really looking forward to getting started in January 2019 - it's a great start to the New Year. I'd like to thank Boulder Media and Dublin Animation Film Festival as well as my family and the lecturers and mentors in BCFE, I wouldn't have won this prize without them!